An unhealthy relationship with food can manifest as being overly fearful about eating certain foods. This can be problematic for people who have been researching healthy diets because there are different healthy diets, all calling to remove different foods. It’s important to understand how to eat healthy while also maintaining a healthy relationship with food. Let’s expand upon how to cultivate this healthy relationship. Dr. Michael Ruscio. DC: Hey everyone, welcome to Dr. Ruscio Radio, this is Dr. Ruscio. Today I’m here with Chris Sandel, and we’re going to be talking about a healthy relationship and healthy psychology with food. This is a topic, as the audience hopefully knows at this point, that I feel to be very important. 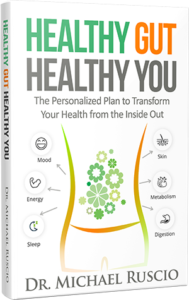 And certainly there have been a number of cases, and we just actually released a user testimonial for Healthy Gut, Healthy You. One of the things that he said was, “In reading your book, I felt this, (I believe he described it as a) psychological backpack taken off his shoulders” when someone from a place of authority finally told him he didn’t have to be perfect with food. And he said that, in and of itself, was a huge alleviation of stress in his life. So these things do matter, they do make a difference. It’s part of the reason why you’ve heard me have a non-overzealous or very strict and strong stance on gluten. But rather, I encourage people to find their own relationship with gluten as one example and then avoid to the degree to which they have a reaction. So with that little bit of prelude, I’m glad to have you here, Chris, to get into this topic in more detail, which I know is one that you’ve dove quite deeply into. So welcome to the show. Chris Sandel: Thanks, thanks for having me. I’m really looking forward to diving into this with you. Give less attention to what others say about how they react to certain foods and pay close attention to your response to foods and what the overall trends are vs the minute to minute responses. Consider opening up your dietary choices, especially if they’ve become too rigid and are not working for you. The psychology of food has a lot to do with one’s psychology as a whole. Often times someone’s relationship with food has little to do with food at all. Get help with your relationship with food. DrMR: So for people who haven’t heard of you before or your work, tell us a little about you, your background and what you’re doing. CS: So I’m a nutritionist based in the UK. So when I finished up qualifying, it was back in 2008, I really didn’t know what area I wanted to specialize in, or where I really wanted to put my time and focus. So I just started out, and see who would show up. It was just kind of by chance that a lot of the clients who were coming to see me had a kind of difficult relationship with food. So on paper, they were actually doing a lot of the healthy things that people are told to do. And they were following a kind of “healthy diet”. But they were coming to me with lots of different symptoms. So that could be poor digestion across the board, depending on whether it be constipation, or loose stools, or heartburn. There’d be lots of poor sleep, insomnia, always feeling cold, lots of energy crashes. A lot of fertility issues, and this is something I started to focus on a lot with clients as well, particularly hypothalamic amenorrhea. So women not getting their period. So they had all of these symptoms. But they also had a lot of fear and anxiety around food. And fear around their body, and weight gain. And as I said, on paper, these people appeared to be sort of following a healthy diet. But it just really wasn’t working for them. I found that I started to enjoy working with these kinds of clients, where I’d be combining sort of, nutrition knowledge, but also looking at the mental and emotional side of things. And just started to read a lot more on this topic, sort of reading about psychology, and all the different factors that go into someone’s relationship with their food, relationship with their body. It was then, that the area that I was writing on more. So I got more of these kinds of clients, and then set up a podcast, and started talking about this more. This has just sort of become the area that I’m sort of most interested in and working with clients in. It was interesting, you said at the start there, you try to not be overzealous, and you kind of try and keep things sort of balanced, whether it be around gluten or other things. I’m definitely someone who does not subscribe to any dietary ideology. I’m very much working out what works for someone in terms of the foods that support them. But also the way that they think about those foods. The way that they exercise, the way they sleep, et cetera. Getting that to work for them. DrMR: I’m curious to hear your thoughts on this observation, Chris. I’ve noticed that it’s probably human nature, that when someone’s not feeling well, they have a tendency to revert to the worst case scenario possible. So if you’re depressed and you’re tired, the internal dialogue might be, “Oh, do I have cancer? Do I have inflammatory bowel disease? Maybe do I have hypothyroid?” We go to these, this very dark place, I think. And maybe part of that is good, because it gets you to turn your attention inward. Which I think that’s pointing us in the right direction. But at least from my observation, it seems like people tend to overreact. And perhaps some of this is compounded by the fact that when someone’s not feeling well, it often times will affect cognition and their neurobiology. Meaning they have a higher predilection perhaps to despair, depression and anxiety, just as a byproduct of whatever it is that’s imbalanced in the system. Current Food Climate Making Things Worse? So this might be pouring gas on the proverbial fire. But what I’ve also noticed, is if we’re existing in this culture where there are extreme claims made around diet, then what that can do is absolutely exacerbate someone’s already existing fear, and perhaps morbid thinking and really make that worse. Now the person who isn’t feeling well and may have these thoughts of despair, then they read about 10 different foods that can all “fuel their problem.” And now they get even more freaked out. Because in the day to day, it’s hard to avoid all those foods. So now they not only are not feeling well, but they’re falling into this natural human tendency to think the worst case scenario. Plus, the worst case scenario is being exacerbated by all these foods that they’ve been programming into thinking are hurting them. It’s a side topic that there’s definitely some benefit that come from figuring out what foods to eat, and not eat. But it seems that for many people, this combination of a culture of very hard lined positions on food, combined with this natural tendency can lead to a really dark place. And this is another area where I think people get trapped. I’m a nutritionist, I really value food, and I think it can be very health promoting, and it can do wonderful things. But there’s also a point of diminishing returns, where food is not the thing that’s going to transform you and it’s actually going to not get you much further. By putting even more and more focus on it, it actually makes things worse. So there are times for knowing, okay, what are the limits here? Where is food stopping actually being helpful here, and actually I need to work on my relationships, or I need to get some more sleep. Or I need to spend some more time outside, or I need to go and see a counselor or a therapist. There are all of these other areas that can be really helpful to people’s health. But they can get very myopic about it’s just about the food, and I’ve got to figure this out typically, by restricting. DrMR: Right, and I definitely want to come to, very soon, what you think the best way to navigate this landscape of restrict my foods more, and maybe find that food that’s triggering me. Or in the opposite direction, maybe loosen things up a little bit. But before we go there, we were talking off-air about this cognitive dietary restraint and essentially, as I took away from how you were briefly describing this, there is documentation that if people have two restrictive or fearful a relationship with food, that can manifest in actual imbalances and disease in the body. So can you expand upon that a little bit? CS: Yeah sure. So there’s a concept known as cognitive dietary restraint. And there’s a fair bit of research looking into it. And I will give the caveat with a lot of this stuff, it is really hard to parse things out and to work out, okay, what is just correlation? What is cause and effect? So I don’t want to oversell this too much. But definitely when you start to look at cognitive dietary restraint, the bulk of the research, it does start to point towards something. So what that term means, it’s the perceived ongoing effort to limit dietary intake to manage body weight. But it’s not just about body weight. They’ll get people as part of the studies to fill out different questionnaires. And it’s really looking at their thoughts around food and eating. And it’s looking at their thoughts around restraint, it’s looking at their thoughts around their emotions around food. Basically just trying to look at what is their relationship with food like. And the important thing to note here, with cognitive dietary restraint, is it doesn’t actually matter what someone does in reality. It’s what they’re thinking about. So you can have two people who have both got cognitive dietary restraint. One is actually following the diet, one isn’t actually following the diet, but they’re thinking, “oh god, I should be following that diet.” So it’s very much looking at that mental process. And what they often try and do with part of the research, is they split people into different groups, and they’ll ask questions around, “Okay, are you on a diet? Have you lost weight?” as part of that. So they can put people into separate groups depending on have they actually lost weight, have they not lost weight? So they can try and rule out, or try and work out okay, what’s possibly coming from the under-eating side of this, and what’s coming from the mental side of it, the cognitive dietary restraint. So as part of this, as I said, there are some various questionnaires, and then they’ll put them into different groups. And depending on what the study is, they’ll then look at different systems within the body, or different functions or different organs, et cetera. And so, there’s been various studies that I’ve gone through with Cognitive Dietary Restraint. I’ve got a podcast, and there are two podcast episodes. They go through this in a lot of detail going through each of the various studies. But when they look at it, cognitive dietary restraint will reduce telomere length. And when I say will reduce, it’s correlated with reducing telomere length, which is a proxy for paging. It impacts on reproductive hormones, and specifically with women, it makes it more likely they’re going to have an ovulatory cycles. It makes it more likely they’re going to have decreased bone density. They’ll have increased CRP levels, which is a marker for inflammation. There are other studies looking at increased blood pressure, looking at cognitive function that is decreased. They have lower levels of Peptide YY after a meal. So this is a hormone that increases with eating and after a meal. And it’s the thing that helps you feel satiated. So if you’re not getting as much of an increase in peptide YY, you’re not going to feel as satisfied with that food. And so all of these different areas are impacted upon by someone’s thoughts around their food, thoughts around guilt or remorse, et cetera, linked to food. So I think it’s really interesting because so much of what we focus on, is what is someone actually doing. Or what is someone actually eating? And less focused on what are they thinking about. Because you can have two people who are eating the exact same diet. And one of them really enjoys this way of eating, it fills them up, it gives them energy. They’re happy to continue eating in this way indefinitely. And you have someone else who’s doing the exact same thing. And they’re finding it very unenjoyable. Feels like they’re restricting, and they have cognitive dietary restraint as part of this. So even though these two people are doing the exact same thing, they’re going to have very different health outcomes because of this. But it’s also likely that only one of them is then going to stick to this long-term. DrMR: Are they looking at other markers? Have they looked at any other markers, like I’m assuming fatigue scores were tracked? And maybe underneath the umbrella of cognition, mood. Do you know if mood and fatigue have also been tracked? CS: I assume they have. The ones that I’ve mentioned, and I wanted to be specific about the ones I mention because they’re the studies I’ve actually gone through. So this is a body of research that I am making my way through. And so, undoubtedly, they have looked at that. Because pretty much, as I’m going through, I’m just seeing more and more different areas that are impacted on it. So I would say I imagine there is, but I can’t speak to that in terms of the research that I’ve looked at. DrMR: Okay. And what do you tell people to kind of talk them off the ledge, so to speak? Because I’m sure that you’ve come into contact with people and worked with people who have worked themselves into dietary angst. And so what are some of the pearls that you offer them, to help cultivate a different philosophy around food? CS: The way I actually work with clients, is that I don’t do just one-off client consults with people. I work with them a minimum of five months. And as part of that, I’m seeing them every two weeks. And I’m getting them to keep a food log, and they’re doing that three or four days a week. And we’re going through it. So the reason why I’m saying all this is, it’s not normally that I’m having these one conversations with people. It’s very much an ongoing process because it takes time to undo and to change a lot of this stuff. But the big thing or where I will often be focusing on, if I’m thinking about it from a physiological standpoint, is getting people to just start to pay attention to how they actually feel. And this is the big part. When I’m using a food log with people, it’s starting to look at: What time are you eating? What did you have? What time did you go to bed? What time did you wake up? It can include other symptoms as well, so what’s going on with your stools? What’s going on with your urination? What’s going on with body temperature? Whatever it may be. But the big thing is actually starting to pay attention to what happens when you do certain things. And the reason I think this is really important is that people take such an outside/in approach. I read this blog or I read this book or I listened to this podcast, and now I have to do it in this way. And what I’m trying to foster is, part of doing this is, let’s do it the other way around. It’s not that you discard all health information. But it’s like, let’s use some of that, but then let’s see what actually happens for you in real life. Because there will be some things that actually are relevant to you and do happen the way that you’ve read they are going to happen, or you’ve heard they are going to happen. And then there will be other things that actually aren’t the case. So I think one of the big things is starting from a place of, let’s actually notice what genuinely happens for you. As opposed to just, this is what I’ve heard. DrMR: Yeah, I think that in of itself can be huge. It’s another thing I talk about in Healthy Gut, Healthy You, which is one of the most powerful things an individual can learn to do for their health is to learn to listen to their own body. Because if you just listen to what you’re told, you can find small bits of information telling you almost any food is bad. So if you just look at all the recommendations regarding dietary restrictions, absent of trying to identify if you have any of those potential reactions, then yeah, you could end up in a very restrictive place. And I think that’s great advice. Which is, the way you can start to see your way out of that is to just listen to your own body. And I’ve found, and I’m sure you’ve noticed the same thing, it’s fairly easy for people to tell what works for them and what doesn’t work for them. DrMR: But I think there’s one clarifying remark for people, which is you have to be looking at these things … At least in my opinion … In a macro scope, not in a micro scope. Meaning, you’re going to have these small fluctuations that are always there, like the stock market. There’s always going to be up/down, up/down. But you have to look at, what is the larger sweeping trend? Because again, in my experience, when people get too minute to minute, they start seeing relationships that aren’t there, and they kind of drive themselves crazy. Have you noticed that same thing, Chris? CS: Totally. I’m always like, let’s look at the bigger picture. Let’s look for what the trends are and see what you start to notice. And as part of that, for me, it’s like let’s try and just change one thing at a time. Or two things at a time. Let’s keep the variable small and make those changes so that you can see what does and doesn’t matter. Rather than changing lots of different things and then you not really knowing what was the thing that really made the difference for you? DrMR: Yep. Another thing that I’ve preached often and wholeheartedly agree with. Firstly, GAINSWave. GAINSWave therapy can help enhance sexual function by using sound waves similar to ultrasound to both stimulate angiogenesis, or the growth of new blood vessels, and breakdown plaques in existing blood vessels. And GAINSWave has been shown to improve erectile function in men according to two meta-analyses and there have also been 40 clinical trials showing various degrees of variability in using GAINSWave therapy. Now, in a direct side by side test Platinum LED lights have produced the highest irradiance of any led light on the market today. And I’ll link to a cool video for this in the transcript. And this is the coolest part. All their lights come with a 60 day trial period and a full three-year warranty. They’re offering $50 off certain products at platinumtherapylights.com. If you use a coupon code Ruscio50 at checkout. Check them out. How do you help people balance the need for potentially needing to restrict additional foods? Or go the other way? And I’m sure there’s probably some qualifiers here that we should paint. Which is, and correct me if I’m wrong, but I’m assuming that you’re not working with a lot of people who haven’t done any kind of dietary elimination? And so maybe you’re seeing more the population who’s already been doing some dietary tinkering and feel like they’re just banging their head against a wall? But wondering if there are some people who walk in, who haven’t even heard of your basic elimination diet? And then you start them there. Whereas there are other people who have done paleo, AIP, low fat, low histamine, Mediterranean, vegetarian, and they’re still struggling. And so with them, maybe you kind of expand them outward? CS: It’s more the latter. So I have a question on my form of “How many diets have you done? List all the different diets that you’ve participated in.” And it’s not uncommon for people to list 20-30 different diets. So it’s normally going the other way. It’s not me starting with an elimination diet, because they’ve typically done the elimination diet. And so it really does depend on the person and what’s going on. But it’s really starting often with a place of structure. Like, “Let’s get you to be doing things on a regular basis.” Because what typically I find is happening, at least for a lot of the clients I’m working with, is the pendulum is swinging quite wildly from side to side. So there’s like, “I’m really good for these days. I’m really good for this week, etc.” And then it’s kind of on and off the wagon-type mentality for a lot of the clients. So it’s starting from a place of let’s get some structure going and then let’s start to include more foods into your diet. And again, looking at it from a perspective of “Let’s do this in a manner that works for you, at a pace that is right for you.” Because with a lot of the clients, as I’ve said, that are coming to see me, there is a lot of anxiety and worry around food. So how do we do this, where we’re trying to keep that anxiety lower. DrMR: I would agree. For people who’ve done many diets, then in some cases, the first step is to kind of talk them out of the need for being so restrictive. And to ameliorate that fear that they’re perpetually under because of their belief system. And just for the audience, in my experience, if people have done three to four diets, and they haven’t seen significant improvement after three or four diets … And typically, I’ll lump into there, paleo, autoimmune paleo, low fodmap, low fodmap with SCD, and then tried a lower carb approach, and maybe even a higher carb approach. So if people have tinkered with those variables, and they’re still not seeing the needle move much, then I assume we have to go somewhere else. And let me stop there, before I paint that ‘somewhere else.’ Would you agree with that Chris? Would you modify that at all? CS: No, I would agree with that. DrMR: Okay, so then the ‘somewhere else’ … I’ve noticed that some people need to do exactly what Chris was kind of outlining. Which is, expand their diet and try to re-establish what norms are around food, and their thoughts around food. And we’ve published a few case studies in our newsletter that have outlined, where the only thing someone really needed to do, was just change their relationship with food. To kind of loosen their grip on health, and they responded wonderfully. But then there seems to be another kind of path we can take at this fork in the road. Where some people may have another medical issue present that needs to be remedied. And that’s really the thing that helps get them to a point where they don’t have to be so restrictive with their diet. And of course, I see a lot of this with patients who have IBS and SIBO. And various kinds of gut/immune inflammatory disorders. Have you noticed any of that, Chris? Do you see the fork in the road where you have to try to adjudicate, with this person, it’s more so the relationship with food. Or this person, it sounds like they might have some kind of active inflammatory burden in their gut, and that really needs to be addressed? CS: Yeah, definitely. When I’m starting with clients, I’m always finding out what other people they have as part of their team. Are they working with a doctor? Are they working with a functional medicine doctor? Have they done various tests to rule out other diagnoses? So yes, it’s definitely looking at, what could really be the cause here? Is it from someone’s psychology? Or is it from something else that is underlying it? So, yeah. But I would say from my experience, or at least from the clients who are typically coming to me, it’s much more that it’s coming from past restriction. From lots of dieting. DrMR: And it’s not to say that we have to do one of these to the exclusion to the other. Certainly, if someone has a fearful relationship with food, I only see them benefiting from addressing that. Plus or minus, if they have something like small intestinal bacterial overgrowth that has to be handled in tandem. CS: Yeah, the core for this for me, is sorting out someone’s relationship with food. And having a healthy relationship with food. Because I think that’s just so important. As we talked about before, from a cognitive dietary restraint perspective, in terms of the psychology. But also then to actually keep up healthy behaviors. And to do the things that actually help them long-term. Because otherwise, if that’s not there, it doesn’t matter how good someone’s plan is. It doesn’t matter what some expert tells you to do, if someone’s not able to stick with that. And I’ll differentiate here between, if someone is telling you to do something for four weeks, I think most people can stick it out. If someone is telling you something that you’re then going to have to keep up for a lifetime, there’s a big difference there. And people have to have the skills to be able to do that. I’ve been thinking about this in terms of an analogy for this. Do you know the marshmallow experiment? DrMR: With the children and delayed gratification? DrMR: Please, give us the outline. It’s a great experiment. And the researcher will then leave the room and they film the kids, and you watch them. And you can see them sitting there and squirming. And some of them will just eat the marshmallow straight away. And some of them will start to pick at it a little bit. And some of them will be able to last that 10 minutes or 15 minutes, until the researcher comes back in. And what’s interesting about the experiment isn’t what happened in the room, and if someone can wait for that second marshmallow. It’s, then what happens years and decades afterward. As part of all this research, they then track these people for years, and some of them even 40 years onwards, and what they found is that the people who can then wait, or delay gratification, have higher SAT scores, lower levels of substance abuse, lower likelihood of obesity, better responses to stress, better social skills. Generally, just better at all ranges of all life measures. They then looked at this, and they’re like, okay, delayed gratification is really important, to the point of let’s teach kids how to delay gratification. What they’ve actually started to look at now as part of the research is delayed gratification is actually not the thing that makes the biggest difference. Delayed gratification is, actually, a symptom of other things. When they start to analyze the kids who can wait, it’s that they’ve grown up in well organized and structured homes, where things happen in a consistent manner. When they were told if something was going to happen, it then happened. Then, the kids who weren’t able to delay gratification were more likely to live in a house where it was erratic and chaotic. They were less likely to see the link between actions and consequences outside of the realm of immediate impulses. So, delayed gratification is a by-product, and that there are all of these other skills that these kids possessed that are actually, the things that make them get the higher SAT scores, the lower levels of substance abuse, etc., etc. I kind of see the same thing with health in that, we focus so much on all of the things that people should do, almost like as the delayed gratification, but without really paying enough attention to all of the stuff that runs under that. The relationship with food thing that actually makes that work. Because if you don’t have that healthy relationship with food, and then you’re just trying to squish or squeeze the healthy behaviors on top, then it’s just not gonna work. Because either people aren’t able to keep it up, or you have all the psychology components that link into that cognitive dietary restraint that I was talking about, that means that even if people are following those behaviors, they’re just not getting the same outcomes as someone else. So, that’s the kinda frame, or how I think about the healthy relationship with food, it’s the thing that really underpins everything else. DrMR: And do you think part of what’s necessary to achieve that Healthy relationship with food kind of borrowing from that example of the children growing up in the more organized homes, do you think that helping people organize their lives like you had mentioned earlier doing one thing at a time, trying to isolate some dietary variables so that they can pinpoint the relationship, the cause-effect for one given food or one given food group. Have you found that to be an important part of achieving a healthy relationship with food? CS: I mean, so much of what I do is got nothing to do with food with people, and so, yeah. In terms of focusing on all other areas of their life is really important. Because it’s those other areas of the life that then allows them to be able to do the food stuff on autopilot. So, yes definitely. DrMR: So what are some of the other, if there are any that you feel worthy of mention, are there a couple of other things that you find helpful to cultivate with people in the work that you’re doing with them? CS: Yeah, if I’m thinking of what are some of the things that could help cultivate that healthy relationship with food or even just a healthy relationship with health and understanding how that really fits into someone’s life, it would be getting people to be able to trust their body and to see their body as something that is a companion and not an adversary. Because it’s really hard to be healthy and to do the things that you should do and be able to listen to your body and support it if it’s not something that you trust and you see it as something that you’re fighting against. I’d say getting people to be able to listen to their hunger and performance levels and being to able to hear these cues is really important. Not fearing food. I think sometimes people come from a place of, oh it’s a good thing to fear food or it’s a good thing to feel shame after eating a particular food because that’ll prevent it from happening in the future or that’ll prevent me from going towards that food. I actually think the opposite. It’s normally that cycle that makes people swing with the pendulum between being “good” and being “bad”. So just having no fears around food. And that’s even the case of someone can’t eat something because it gives them an actual symptom. The difference between fearing it and just knowing, okay I shouldn’t eat that thing because I know I feel not well when I eat it. I guess knowing that some meals are going to be more enjoyable, some meals are going to be much more functional. It’s this kind of getting this right between food being important in your life but also being a minor thing that drops into the background. So that it isn’t all-consuming. And just getting that balance right really does help. I’d say probably another one which I kind of touched on earlier which was knowing food’s limit in terms of how and impact on your health. And when it’s time to be focusing on other things because you’ve just really maxed out on what food is going to be doing for you. DrMR: Are there certain foods that you find people have a relatively high amount of fear around? CS: It depends on the individual because if I was to look at the last 15 years, the whole low carb craze or low cab thing has been bigger so carbs have been much more of a fear for people, more broadly. But if I’m working with someone who’s older, fat is much more of a fear and it doesn’t always work that way in terms of the age split. But it really, it depends on the individual. It depends on what they’ve been reading, it depends on what they’ve been following to determine where their fear lies. DrMR: I mean that makes sense. Certainly, it just shows you the power of education because people aren’t just born with these fears of foods. They are learned and I guess that’s maybe a ray of hope that they can also be unlearned. CS: Definitely, I really do think that they can be unlearned. As I said, earlier on, I think one of the best ways of unlearning that is getting people to pay attention to their body. Because so often the foods that people most fear once we can get them eating them, including them again they’re like, oh wow I actually do so much better on this. When I eat more carbohydrates I sleep at night. When I eat more carbohydrates I have better energy. When I eat more fat I’m now getting my cycle. And I think the same is true the other way as well. Where people are trying to stack up on all the foods that they think is really healthy that don’t work for them. And so it’s not uncommon from when I work with clients who I say, you know what, I just don’t think you’re doing so well with salads. I just don’t think you’re doing so well with all the lightly steamed vegetables that you’re eating. And once they then pull them down or remove them, they’re like my digestion is so much better now. And so I think it works both ways. It’s that we have ideas of foods that we definitely should avoid that actually do really well for people. But we also have lots of foods that we think of as healthy that doesn’t always work. And this is a really big thing I focus on with clients is context matters. There are very little absolutes in the realm of health. It really does come down to you and what’s going on for you at that moment. What’s going on, because the weird time when maybe someone can’t eat salad because they don’t digest it so well but then they do more healing, things get better, and then they include it and it’s fine. So it does matter about context. DrMR: I think that’s very well said and it is amazing what you can learn if you just simply listen to your body as you’re noting there. Chris, where can people track you down on the internet? CS: So the best place to go, my website is seven-health.com is my site. But I also have a podcast called Real Health Radio which I would direct people towards because that has some of the most up to date information. I do episodes like this where I speak to a guest but I also do lots of solo episodes where I delve into a topic on my own. And I mention about cognitive dietary restraints, I’ve done a couple of them, on that topic. A lot of episodes where I’ll spend a lot of time going through topics. But trying to do it in a very balanced and sane way because I do want people to be able to eat in a way that is and both healthy but is also just not overrunning their lives. And they’re able to get on with the things that are much more important in their lives. DrMR: Awesome. That’s a great message Chris and I completely agree and thanks for doing the work that you’re doing. It’s an important message. I’m glad that you’re out there trying to usher that more so into the regular sphere of the dietary conversation. And thank you again for taking the time for being on the show today. CS: Thanks for having me and it’s great to chat with you. Wonderful discussion. I’ve had several years of restrictive dieting and erratic behaviors with food, all leading up to complete lack of awareness about what my body is actually telling me about food. There is absolutely no one-size-fits-all approach to any of this. The notion that fear of eating or guilt when eating actually affecting your health is mind-boggling, but makes total sense. Thank you Chris and Dr Ruscio for this awesome information.